Our 18th Annual February Tattoo-A-Thon is Feb. 23, 2019 8:00 til Midnight Benefiting the UC Davis Children's Hospital. Our 30 wonderful volunteer tattoo artist (from all over) contribute their entire wages including tips to the Pediatric Intensive Care Unit. Thank you all for coming out this year! 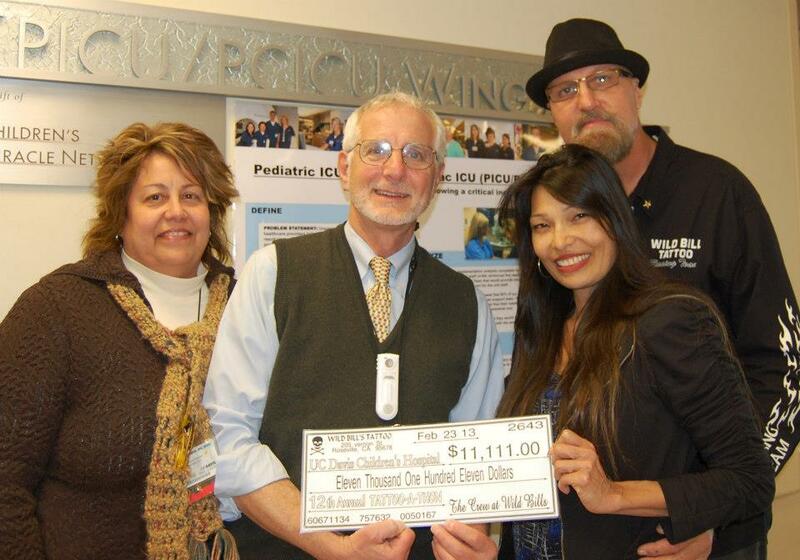 To date we have raised $223,000.oo The Hospital named part of the new wing after the Tattoo Shop. What an honor! None of this would be possible without our clients and staff Appointments preferred (to avoid a long wait) but not necessary. Please come with your ideas for a tattoo on paper (if possible) it’ll save time. More qustions? Please read some of the stories below. 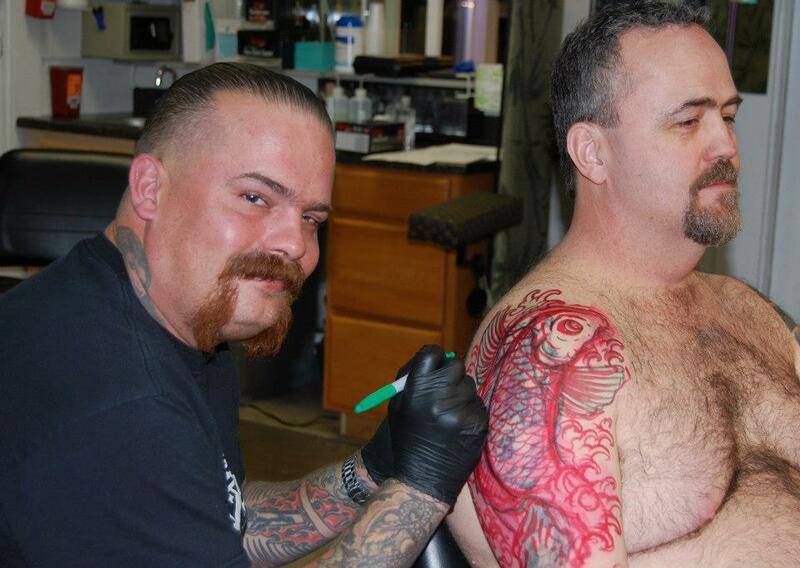 Bill Hill, owner of Wild Bills Tattoo in Roseville shows off his body art. Hill hosted guest tattoo artists from other shops in a tattoo-a-thon to raise funds for the UC Davis Children's Hospital. Working from 8 a.m. to midnight last weekend, employees of Wild Bill's Tattoo in Roseville and a few guest artist from other shops raised $17,000 for the UC Davis Childrens Hospital, tattooing ans piercing more then 100 people. "That's a really long day for a tattooist," Wild Bill said. "People think tattooing is an easy job but it's not. It's hard on your eyes, hands, neck and back. A full day of tattooing will leave you very drained." To date Wild Bill's has raised more then $95,000 for the Children's Hospital. The Davis Aggie Newspaper Feb 20, 2009 - Getting Inked for a good cause! 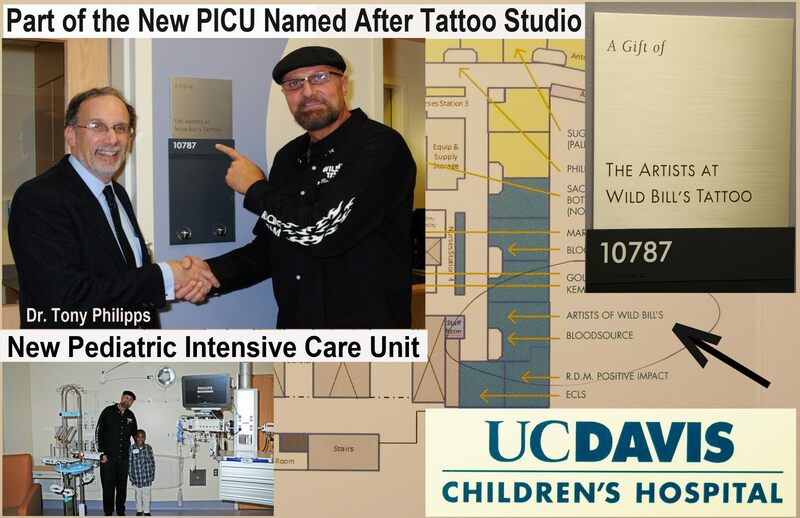 It's not usually the case for a tattoo parlor to be involved in community philanthropy, but for over seven years Wild Bill's Tattoo has been donating thousands of dollars to the UC Davis Children's Hospital. Wild Bill's Tattoo will be hosting its eighth annual Tattoo-A-Thon this Saturday from 8am to midnight. The shop is loacted at 205 Vernon Street in Roseville. Eighteen volunteers will be working for 16 hours that day, and all proceeds will go to the UC Davis Children's Hospital in Sacramento. 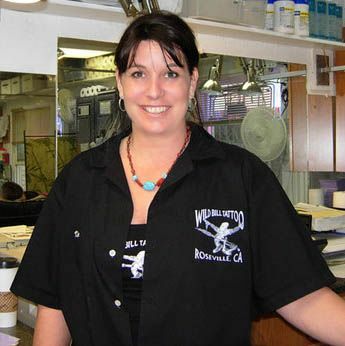 Last year, the staff at Wild Bill's worked "16 hours nonstop, piercing and tattooing more then 100 clients, and raised a total of $15,150.00 including clothing and accesory sales" Hill said in a email. The event attracts people from all over in support of the charity. "We get lots of people with kids, kids that have been sick, kids at the hospital right now" Hill said. "The event in many ways is a good way for young patients to get their minds off their health." Kristal Betancourt, a tattoo artist at Wild Bill's, finds that the most rewarding part of the event is working together for a good cause. "We donate all of our time and energy to this whole day," she said. "Any monetary compensation could not be better than that for us the fact that it's community supporting the childrens hospital and that I have two kids myself, any kind of help especially to a hospital is the biggest contribution that we can make as individuals." Because the annual event draws in such a diverse group of people, many bring their family members, friends and even children. Kim Merseph, a mother of three, heard about the Tattoo-A-Thon through a friend and is planning to make the trip with her family and friends this Saturday. Merseph's oldest son has had three heart surgeries at the UC Davis Children's Hospital. "I think it's important to grt involvrd in this day and age with the econony the way it is," she said. "We have to pull together and help out when we can. 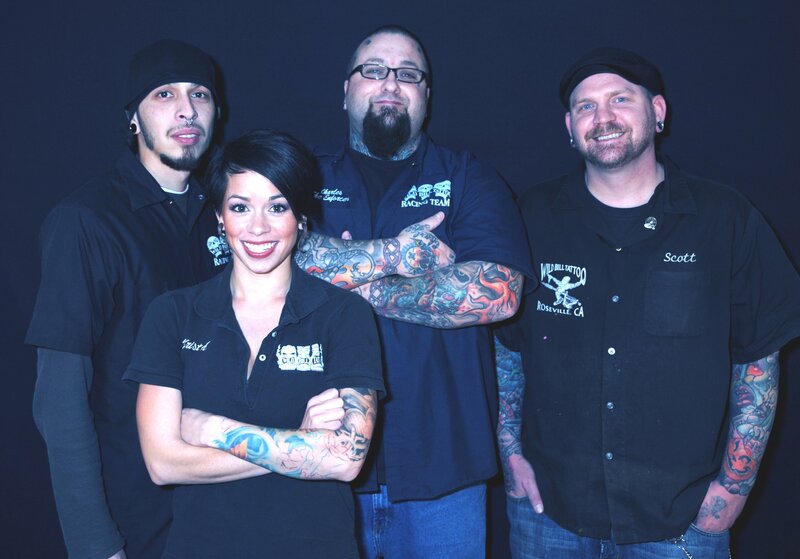 I think it's awesome that the Staff at Wild Bill's Tattoo is donating it's services." Wild Bill's Tattoo, now in it's 35th year of operation, has raised a total of $78,000.00 for the Children's Hospital over the last seven years. "We are so fortunate to have a world class medical facility like UC Davis Children's Hospital here in Sacramento," Hill said. "The hospital and it's renowned medical staff have a profound impact on our community. 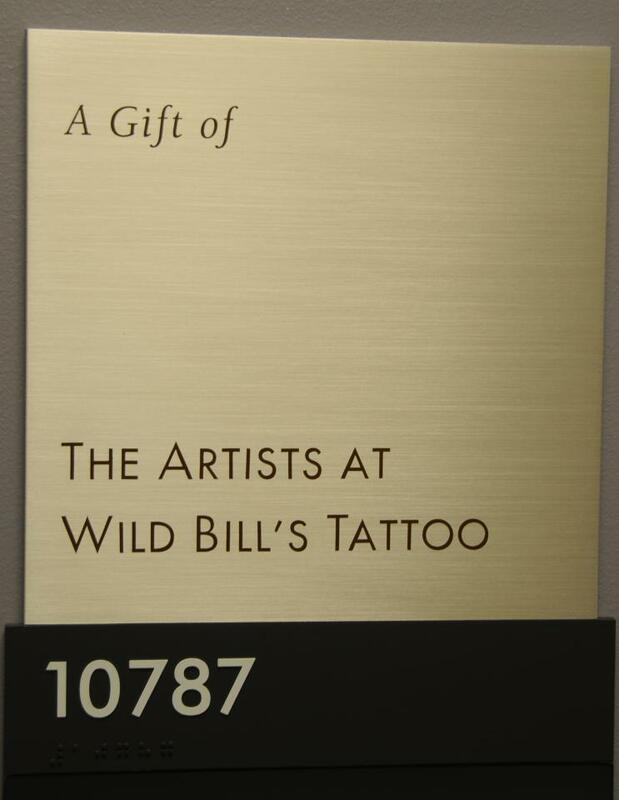 The hospital informed us that they are naming part of the new unit at the hospital after our tattoo shop. I could'nt believe it. We are truly honored." Staff members, friends and customers of Wild Bill's Tattoo in Roseville recently turned ink into gold as far as officials with a local children's hospital are concerned. Employees of the local parlor recently worked a 16-hour day, inking and piercing more than 90 people, to raise more than $14,600 during the sixth annual Tattoo-A-Thon to benefit UC Davis Children's Hospital. All of the day's receipts and tips were donated to the cause. Raven, left, a tattoo artist at Wild Bill's Tattoo, works on a customer during the event. Asking employees to work a full day plus overtime - without collecting any pay - isn't usually considered a way of inspiring workplace satisfaction. But William Hill, proprietor of Wild Bill's Tattoo in Roseville, managed to do just that. On Feb. 25, none of his employees was earning a cent, but all of them were happy to be there.
" It's worth it," said Melissa Funk, a tattoo artist at the venerable Roseville Of course, Hill wasn't earning anything either, except maybe the gratitude of doctors, parents and children - all of whom stand to benefit from the shop's participation in a charity event contributing to the UC Davis Children's Hospital. Last Saturday's "Tattoo-a-thon," now in its fifth year, was part of a larger effort by Entercom radio stations, including 98 Rock, KWOD 106.5, Smooth Jazz 94.7 KSSJ, 96.9 The Eagle and 107.9 The End, to raise funds for the hospital. Five years ago, Kim Forrest, a tattoo artist at the shop, was listening to the radio when she heard a story about a child treated at the hospital. "I called in and said I would donate everything I made that day to their radio-thon," Forrest recalled. "It progressed from that. Now, our whole shop has been involved." Each of the outfit's artists worked up to 15-hour shifts that Saturday, donating all proceeds - including tips - to the Entercom charity fund for UC Davis Children's Hospital.
" They've been great supporters over the years," said Jacquelyn Kay-Mills, a spokesperson for the hospital. "All the money stays in our community hospital here. We use the money for research, patient care services and equipment that we wouldn't be able to purchase without the funds." The hospital counts 437 on-staff specialists, who help treat nearly 74,000 children annually. It's the only level one pediatric trauma center in Northern California, and its 350 in-progress research studies make it one of the most active children's hospitals in research. Mid-day Saturday, Hill described the turnout as "phenomenal." And it's easy to see why: The shop was filled with regulars looking to augment their already-impressive array of body art, as well as first-timers nervously awaiting going under the needle. Laurie Cristoni was part of the latter. The Citrus Heights resident admitted being a little apprehensive, since her tattoo - a floral wraparound - was to be located around her ankle, a particularly sensitive area. But the event's cause convinced her to go ahead.
" I've wanted one for a long time, but a friend of mine's daughter has leukemia," Cristoni said. "He told me about the event today. Basically he said, 'Hey, if you want to support this hospital this is the way to do it.'" A lot of people are waiting for an excuse" to get a tattoo, Hill agreed.
" Eean and Nicole Levin used the event as an excuse, too - to try to take their minds off their newborn son's condition. He was born unable to breathe without a respirator. "They've been telling us, 'Get your mind off of things, get your minds off of things,'" Eean said. So, after hearing about the Tattoo-a-thon, Eean and Nicole took a break from the intensive care unit and decided to try some ink therapy. Eean's new tattoo makes tangible what's already close to his heart: in neat cursive on the upper left side of his chest, it spells out Elyjah - his son's name. By midnight, nearly 150 people walked out more decorated than when they walked in, helping collect over $17,000 - $5,000 more than last year. That brings the five-year total to over $45,000. Not a bad haul, considering tattoos used to be the purview of sailors and motorcycle enthusiasts. These days, though, the inky artwork adorns people of every demographic - from the secretary in the front office to the business executive. That's good for business, and during the Tattoo-a-thon, it's good for the hospital.
" Now, it's more the norm. It's become socially acceptable." Nathan Donato-Weinstein can be reached at nathand@goldcountrymedia.com. Wild Bill Hill and his crew want to burn and pierce for the kids. 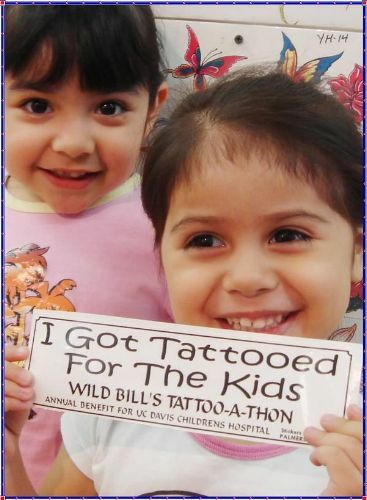 Wild Bill's Tattoo in Roseville, popular with Harley buffs and Sacramento Kings alike, will donate every penny customers pay on Saturday to the UC Davis Children's Hospital. Ten skin-artists will plug away with electric needles for hours; massages will be provided to make sure tired hands don't turn out a jagged squiggle instead of a pirate ship. Folks who don't want to stand in line can buy a gift certificate and come back later. A total of $11,720 was raised last year. Customers waited for hours, baring arms, legs, backs and other body parts to rack up more than 200 tattoos in 16 hours of non-stop action. That's a lot of freaking tattoos. William Hill, the acclaimed tattooist and designer of Roseville's outgoing mail-cancellation mark, is better known to his friends and clients as Wild Bill. He was a bit of a hell-raiser in his early days. At 14, Bill built his first tattoo machine and began experimenting with it on himself. His first project, he said, was a girl's name; his second was a design to cover it up. He has had some life experience. Wild Bill is a man who decided to give up drinking a full year before he reached the legal drinking age. It's good to know his hands will be steady on Saturday, when, beginning at 8 a.m., Bill and nine of his fellow artists will undertake 16 straight hours of tattooing for the fifth annual Wild Bill's Tattoo-a-thon, a benefit fund-raiser conceived by artist Kim Forrest. They will donate all of the day's revenue to the UC Davis Children's Hospital, which cares for tens of thousands of kids every year. 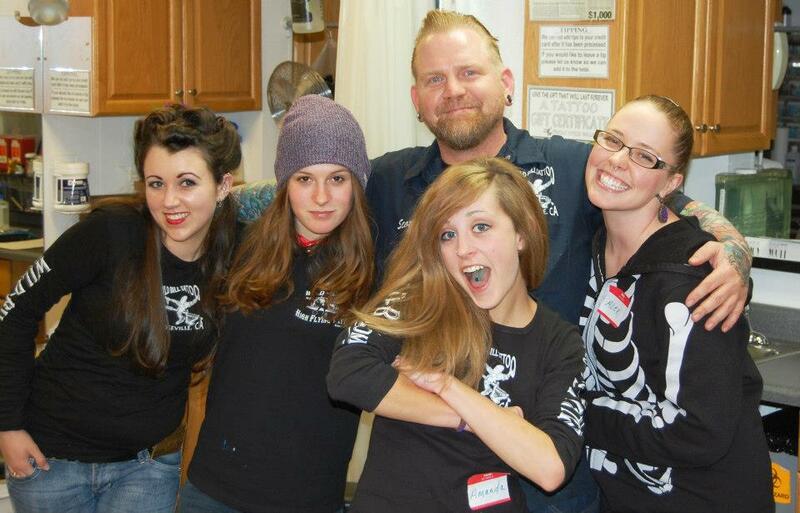 Last year's Tattoo-a-thon raised $11,720. "This year," Bill said, "we are going to try our best to top that." 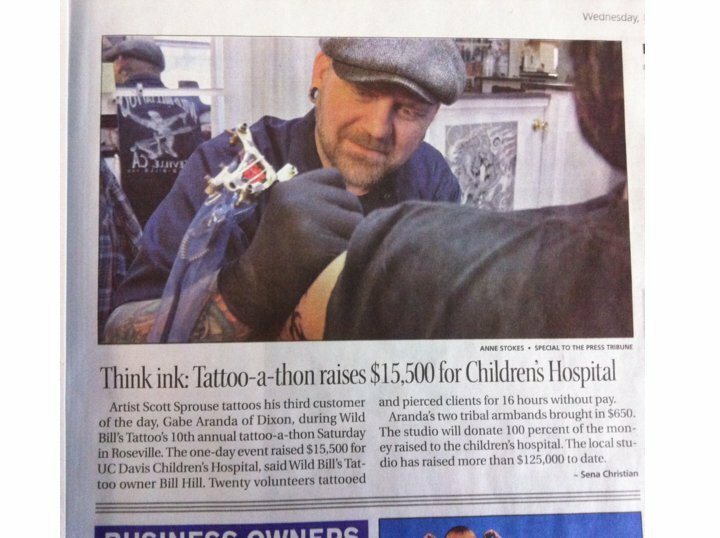 Since the 'thon began, the Wild Bill's staff has raised more than $31,000 for the hospital, officially proving that in certain circumstances, tattoos can be very good for children. Childhood, remember, is a time in which to feel invincible. Everyone deserves to be healthy and happy in his or her youth--free, as Bill was, to misspend it. So, for the children's sake, think about getting some ink. Tattoos start at $50. Gift certificates are available. But if you really want to live, show up at a quarter before midnight when everyone's really punchy and ask them just to improvise. Wild Bill's is at 205 Vernon Street in Roseville. Call (916) 783-9090 or visit www.wild-bills.com for more information. In a touching strike of irony, a local tattoo parlor will help save the lives of children by inking and piercing people “till the skin runs out” as part of a marathon fund-raising effort this weekend. 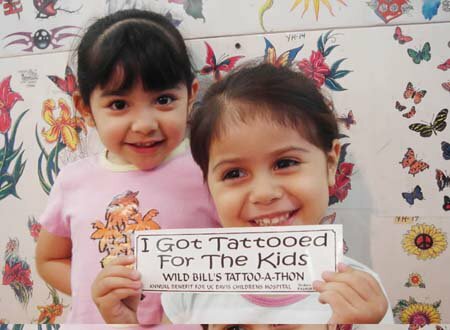 For the third consecutive year, the staff at Wild Bill’s Tattoo Parlor at 205 Vernon St. will work from 9 a.m. to midnight Saturday and donate every cent they make to a radio-thon fundraiser for the UC Davis Children’s Hospital. “Wild Bill” Hill, the shop’s tattoo-adorned proprietor, said they would be placing lawn chairs outside of the lobby to get ready for the large number of customers they expect Saturday. Hosted by Entercom Sacramento, the radio-thon is airing on five local stations, including KDND-The End, KRXQ-98 Rock, KSEG-The Eagle, KSSJ-Smooth Jazz and KWOD-106.5. This week, each station is featuring on-air interviews with children receiving treatment at the hospital, and giving listeners a chance to make a donation. Artist, Kim Forrest, said the first year they participated they donated $1,200, which included their wages for the day. But last year the team worked for15 hours straight and raised a total of $6,000, about three times a normal day’s business. She said one of their employees spent the entire day drawing tattoo designs for customers. Forrest had a son die when he was age 2½, so when the couple heard about the fund-raiser on the radio, they immediately felt drawn to contribute. “There’s definitely a lot of personal meaning behind why we’re doing this,” she said. All seven tattoo stations and one piercing station at Wild Bill’s will be in use Saturday, with about 10 employees working all day. All jewelry sales will also go to the children’s hospital. According to Forrest, a colored tattoo generally lasts about 10 years before requiring any touch ups, with black and gray designs enduring even longer, depending on the individual’s skin. By law, the shop will only tattoo or pierce individuals over age 18 with valid ID, and will pierce teens age 16 and 17 with parental consent. Forrest said the most frequent visitors to Wild Bills are people 18-to-25 years old. But every once in a while they are surprised. “We get 40-year-old women in here on their birthdays getting a tattoo for the first time,” she said. “One time we had a woman 80 years old come in to get a tattoo. We still asked for her ID, though,” she joked. Hill and Forrest also see their fair share of celebrities. As huge fans of the Sacramento Kings, Hill has tattooed many of the Kings and other famous athletes. The tattoo artist has a mysteriously large collection of their shoes hanging by their laces above his station at the shop. Hill said while Kings forward Peja Stojakovic did not get a tattoo when he dropped by the shop about a month ago, he wants to get his first tattoo at the end of this basketball season.